Legendary alligator is one of the unique animals in Red Dead Redemption 2. You’ll need to hunt down the bull gator for the legendary alligator skin, which is required for crafting several high-end pieces of clothing. A lot of people are having trouble finding this beast, which stalks its prey in the marshes of Lemoyne. In this guide, we’re going to show you Red Dead Redemption 2 legendary alligator location, to help you out on your hunt. If you were actually looking for proper bulls (the kind with horns), you should take a look at our RDR2 bull locations map. 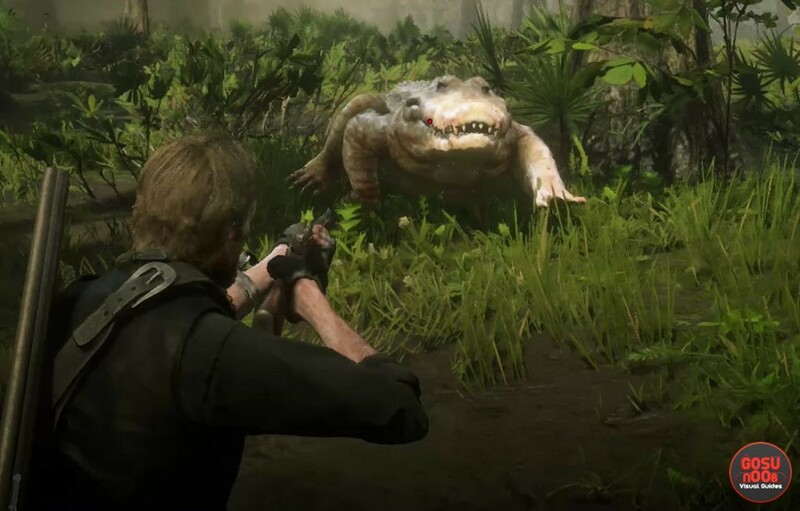 Where to find legendary alligator in RDR2? The legendary bull gator cannot be hunted until you finish the chapter 4 mission called Country Pursuits. As expected, it can be found in the swamps of Lemoyne afterwards. His domain is north of Saint Denis, in the marsh south of Lagras. Once you enter the area, you’ll get a notification that a legendary animal is nearby. If the tracking skill doesn’t provide you with a clue, try leaving the area and returning. Make sure you bring heavy hitting weaponry with you, and try to kill the gator using dead eye before he can attack you. If your core is full, and you have a good weapon, you should be able to down him in one go. He’s vicious and incredibly strong, and if you allow him to approach you, you’ll end up dead soon enough. Once you’ve killed it, skin it to get the legendary alligator skin and legendary alligator tooth. The former can be used by a trapper to craft a vest or a pair of boots, while the latter is used for a unique trinket you can buy from the fence. If you lose the pelt before selling it, the trapper will still be able to craft the stuff, but you’ll miss out on the $50 you’d get from selling it. I’m not even getting the notification that I have entered legendary animal territory for the Legendary bull Gator. I have tryed leaving the area several times and no luck. Definitely have already killed bronze which is a mission after country pursuits, and the gator just is non existent. This must be bugged. I finished country pursuits, and have been running around the area shown above and cannot even get the alert that I’ve found a legendary animal. WTF. Same with me, no notification of the legendary animal or any marking on the map, will try again later, hopefully just a “glitch in the matrix” and it pops up after I turn it back on. Did you kill him in the earlier mission? Yeah I’m thinking it’s bugged. I trawled the area for a solid hour, leaving and returning several times and even restarting the game twice. Still no luck. I keep getting you’ve entered legendary animal territory but there is too much activity in the area to track it. Should I kill all gators in the area? I’ve tried coming early morning late at night and still same message. Same here. I get to the area where you are supposed to be able to hunt it and the message pops up but it always says there is too much activity in the area. I’ve gone away for days and come back and it’s always the same. I’m at the end of the game btw. I don’t even get a “you’ve entered a legendary animal” when I’m in the area and I’ve completed the mission already. I have completed the mission and it still haven’t spawned.